IML Marine Management Ltd was incorporated in 1989 and conducted its first business as Line Operators with a Tramp Liner Service to the Eastern Mediterranean. Things changed, however, when the first Gulf War created a demand for more Shipping services and IML took the opportunity to start a RoRo service to the Arabian Gulf. The company began acting as Shipping and Forwarding Agents, specialising in Truck, Plant and Construction Equipment Shipping – the speciality that IML has since become renowned for. 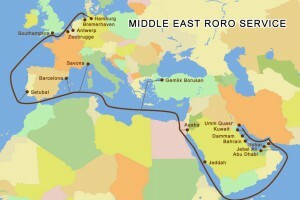 The RoRo service to the Arabian Gulf has become the core part of IML’s business, with Director Jonathon Turner having made 3 or 4 trips to the Middle East every year for the last 25 years, his accumulated, in-depth knowledge of the region lends invaluable support and strength to the quality of service IML can offer its clients. In addition to establishing the Europe to Middle East Shipping Route, over the past few decades the Company has developed into leading player in Global Project Forwarding business. IML has a dedicated team of Staff, who combine Shipping & Transport expertise with knowledge and understanding of Lifting, Construction, Mining & Forestry Equipment.